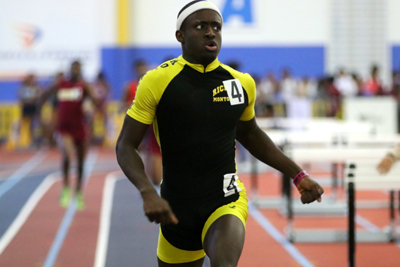 Richard Montgomery's Seydi Sall broke the meet record and the all-time Montgomery County record when he ran away from the field to win the 500-meter dash in 1:04.47. He said that he felt great but also that he was not really hyped about the time. Said Sall, "I'm not really on it that I ran that time. I'm just trying to run faster, run harder, and go hard next time...It's good. I PR'd. I did good. But I feel like I still have a lot more in me that I can do later on this season." "I came through the 300 and I saw that I was at 36. I was supposed to come in at 35 so...once I saw that I just went faster. I feel like I was going too slow." The 400 meter split? He didn't know what it was, but it was too slow. "...Next time I'm going to try to come in a little faster," he said. The Richard Montgomery junior missed nearly the entirety of his sophomore year on the track due to repeated hamstring strains. Four days earlier at the Montgomery Invitational, he told Mocorunning that he was "85% healthy." Wednesday at the Montgomery County Championship, he said that injuries are not stopping him: muscle memory is. "I think it's just racing. This is my third 500 in like two years. So I feel like the more I race, the faster I'm going to get. I just started training about like three weeks ago. So I didn't really get much training in. So we have like two or three weeks until regionals. If I get more training and see how I can get out faster and improve, I feel like I can go a lot faster." 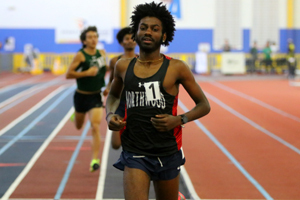 By focusing only on the 1600-meter race, Northwood's Eldad Mulugeta and Obsaa Feda wanted to put up an impressive performance and blow away the county meet record of 4:20.09 (set by Diego Zarate in 2015). Mulugeta said that they were shooting for 4:15. To accomplish that, they wanted to hit 31 second laps. Said Mulugeta, "We were trying to run 31...32. No slower than that. But the first lap was 31 and the second lap was 33. I think that messed it up. And then we went out like 2:10 [800m]. We were trying to go like 2:07. I just messed up from the start." You would not know it from watching the race that Mulugeta was slightly disappointed with his execution. Feda and Mulugeta swapped leads knowing that they needed to shake off Walter Johnson's rising star, Rodrigo Yepez-Lopez. Real or imagined, Mulugeta believed that Yepez-Lopez had done more speed work than he, and he did not want to let the race come down to a sprint. "I knew I had to go early because I think Rodrigo was doing more speed and we haven't done speed. I had to go and take the speed out of him." He said that he looked up at 1200 meters and saw 3:18 so he wanted to do 60 seconds for the final two laps. By finishing the final two laps in 62 seconds, his last two laps were his fastest. "4:20..." he continued. "It's not a bad time. I leaned a little bit just to get the meet record, but I didn't get it so it's whatever." 4:20.25 was the second fastest 1600-meter performance in meet history. He became the first county champion from Northwood High School in the 1600-meter event. 4:21.65 was an indoor PR for Feda and 4:21.93 was a new PR for Yepez-Lopez. The Paint Branch boys scored in all 14 events and piled up 133 points to secure the 2019 indoor county championship title. 133 points was the second highest point total in meet history for boys or girls. 21 out of Paint Branch's 24 male performances (excluding preliminaries) scored positive points. Said Coach Dessalyn Dillard, "I think today everyone had a plan and their job was just to come out here and execute and put points on the board. I believe that they did a very good job of just staying focused, taking things one event at a time, and just making sure that they executed." It started with an upset win in the 4x800-meter relay in 8:07.87, an outcome which only 21% of Mocorunning poll-voters predicted. 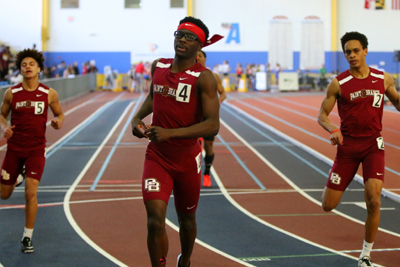 Then came the incredible 1-2-3 sweep of the 300-meter dash by Chukwumdi Osuji, Jaeden Burke, and Max Davis. Paint Branch's momentum snow-balled from that dynamic moment. Said Dillard, "Everyone fell right in and yeah, the people in the building, the energy just started to spread a little bit and everyone jumped on board." Sweeping the top three spots in a given event is something that has only been accomplished three times before in meet history: 2016 in the boys 55-meter hurdles (Northwest), 1998 in the girls 800-meter (Richard Montgomery), and 1988 in the girls high jump (Whitman). 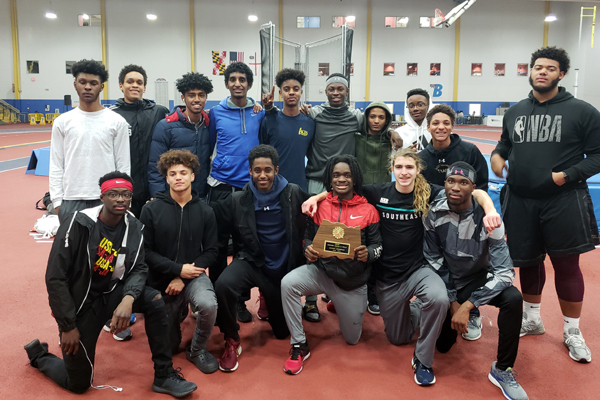 It was just the second time ever that a boys team swept the top three spots in any event at the indoor county championship meet. 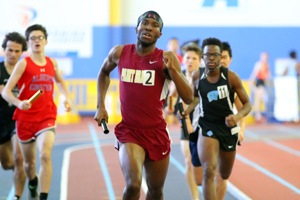 Northwest High School piled up 96 points which would have been good enough to win the county title some years, but Paint Branch was just too strong all-around. 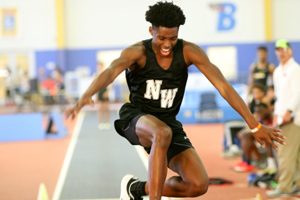 Despite its indoor county title winning streak ending after four years (2015-2018), Northwest walked away with plenty of hardware including gold for Anthony Woods Jr. in the 55-meter dash (6.47, #3 in meet history), and three golds won by Clarence Foote-Talley in the high jump, long jump, and triple jump. Foote-Talley, the triple jump outdoor state record holder, said that he was aiming for the meet record in the triple jump (45-09) and a national-qualifying mark in the long jump (at least 23 feet, which also would have been a meet record), but he started off slowly and was bothered by injuries in his glutes and hip flexor. He did not land what he called a "good jump" until his final jump in the triple jump finals (45-08.25) which missed the meet record of 45-09 by 0.75 inches. It was well-shy of his typical performance so far this year which has been in the 48-foot range, but the nagging injuries subsided as he progressed through the high jump which he won with a jump of 6-02. "I started off after the high jump, I was pretty pumped up to go jump. I was trying to get 23 today to qualify for nationals. It didn't go as planned, but I still jumped pretty good. I jumped a 21 [21-05.50, #8 in meet history]." Although he came up short on some of his goals, he said that he was proud of his day of work at the county championship meet because he gave it his all. "I definitely need to work on my approach, and I need to go in the weight room a little bit more and get a little more strength in my legs," he added.